If there were a top ten quotes that capture the essence of what innovation is about – the human spirit pushing boundaries – this would definitely feature as one of my favorites. It captures the mentality – the shared attitude, mindset, way of working, and way of thinking – that unites people in innovative organizations. When I explore the quote during workshop discussions, the general consensus is that it fires up the imagination, conjuring vivid images of intrepid explorers and innovators from the past. Quite a few people who aren’t familiar with the quote assume it came from Steve Jobs, the former Apple CEO. In fact, the quote is widely attributed to another innovative thinker – Walt Disney. What many don’t realize is that it actually comes from one of Disney’s employees, who coined it for a new and exciting customer experience, the Epcot Horizons ride, back in the 1980’s. When I found out that a Disney employee came up with this, I was amazed! Those of you who have led teams will know how hard it is to get people to understand and buy-in to the most rudimentary game plan. In Disney’s case, this quote was evidence of organizational vision operating at a whole different level completely. Disney had created a believer who not only understood his vision, but also more significantly, cared enough to own it and then articulates the philosophy in a richly authentic and personal way. And therein lies the powerful connection between vision and innovation. (for me) the part that vision has to play in shaping, nurturing and embedding a corporate mentality and, by association, its culture. In this case leading the way to a flourishing environment of innovation and creativity – a place where innovation was everybody’s business, no matter who they were in the organization. But why get so excited about an employee coming up with a snappy quote… and what does this have to do with innovation? The answer lies where and how this quote was born – from an employee working on a major new customer experience, the Horizons ride at Epcot. The ride was highly innovative at the time, using groundbreaking technology to create a market-leading theme park that brought magical experiences to the visitor. There was nothing like it at the time; the people working on this new experience were thinking like Disney, and everything they thought and did paints a vivid picture of employees living and breathing innovation in complete alignment with the business priorities. Looking back at the Horizons project team, I bet there wasn’t a single nametag or project-name containing the ‘innovation’ moniker. 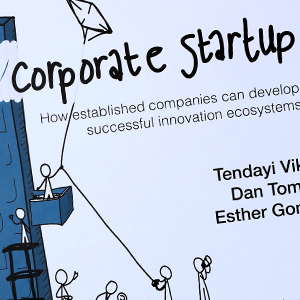 Innovation was simply part of the corporate mentality and DNA – the way they did things and the way they thought. It was a mentality nurtured from a philosophy so deeply ingrained that the employees naturally reproduced, and arguably enhanced, Disney’s original thinking. They brought it to life in a way that connected the Walt Disney vision to a business reality that placed the customer at the center and generated strong profits. Is this not ultimately what innovation is all about? Employee thinking was hard-wired to Walt Disney’s vision and the vision brought innovation to life as part of the daily zeitgeist. Innovation wasn’t regarded as an appliance – to be plugged-in, switched on and hey presto, it just happened! It was interwoven into Disney’s identity and core purpose – informing, directing and shaping everything that they did. Innovation was simply part of daily life, part of the mental attitude that defined the behavior of every Disney employee. In 1993, the renowned management thinker, Peter Drucker, described innovation as “…the specific instrument of entrepreneurship… the act that endows resources with a new capacity to create wealth.” For some, innovation can mean optimizing the potential benefits within a new idea. The idea may be exceptionally creative – or it may already exist with the potential to be improved into the next big thing. Yet without a collective innovation mentality, these ideas will struggle to come to fruition in any organization. I’ll illustrate this with a great story that Malcolm Gladwell outlined in the New Yorker about the famous story of the Xerox mouse and personal computer. The story begins in 1979 when the 24-year-old Steve Jobs made a deal with Xerox. At this time, Apple was already one of the hottest tech firms in the country and everyone in the valley wanted a piece of it. Jobs proposed a deal: he would allow Xerox to buy shares of his company prior to its highly anticipated IPO in exchange for PARC (Palo Alto Research Centre) opening its kimono. A lot of haggling went on about what Jobs was allowed to see and what was to be kept secret from him. In the end, Xerox went ahead and Jobs was given a couple of tours which ended up with him standing in front of the Xerox Alto, PARC’s personal computer to watch a demonstration. Larry Tesler, the engineer, moved the cursor across the screen with the aid of a ‘mouse’. Tesler clicked on one of the icons on the screen. He opened and closed ‘windows’ deftly moving from one task to another. He wrote on an elegant word-processing program, and exchanged emails with other people at PARC, on the world’s first Ethernet network. Immediately after the meeting, Dean Hovey (who headed-up industrial design) went to Walgreens and bought all the underarm deodorants that he could find because they had a ball in them. He also bought a butter dish – and so marked the beginning of the Apple mouse. Steve Jobs was a master at improving existing ideas when he repurposed the technology sat gathering dust in PARC – Drucker’ definition of innovation really could have been built with Jobs in mind. I wholly subscribe to Drucker’ thinking. However, what stands out with this and other mainstream thinking on innovation is the all-too-often absence of humanity. In other words, the primal emotions that drive innovation and creativity, such as curiosity, thirst for knowledge, understanding …and the desire for meaning. Also, let’s not forget the importance of emotional connection to the consumer. If emotion is indeed a key element to achieving innovation, I find it curious how often the humanity bit is missed. To create a real culture of innovation, organizations need to create an environment that enables innovation and creativity to first exist and then flourish. All innovation activity needs to be purpose-driven, both understanding and connecting with the business reality. Ultimately, organizations are here to serve the customer and to build a healthily sustainable business – innovation must be wired to this end… to creating value. Innovation cannot be treated as a standalone project, plugged in like an appliance, turned-on by the flick of a switch with minimal sponsorship, championing, role-modelling, resourcing and general thought and effort invested. If you’re lucky enough to have a Chief Innovation Officer or similar role within your organization, they need to be mandated with a clear and aligned purpose, as well as backed, empowered and resourced. They cannot fire-up the organization on their own. Conventional wisdom tells us that innovation will only be achieved in an organization that has the correct culture in place to support it – and innovation must be fully aligned to the business objectives and priorities. For innovation to thrive, it is imperative to understand that it is ‘people’ who operate at the sharp end of innovation – not organizations. Few companies believe they have the correct innovation way-of-thinking or way-of-working (aka culture). Culture takes time to develop and form iteratively as a result of doing, analyzing, learning and then doing again, but better. There is no shortcut, one size fits all, silver-bullet or yellow brick road that leads to an innovation utopia. Just like people, organizations come in all different shapes and sizes. To succeed, it is critical to accept the current cultural position, take small steps, and then stretch the organization over time to regularly test its innovation appetite. An initial focus on incremental improvements helps establish behaviors that can then be harnessed later. The organizations’ culture, structure and strategic goals will also impact how you will innovate and the pace at which you progress. When framing innovation in an organizational context we need to seriously consider and factor how change really happens. Amidst a competitive climate of ever-increasing acceleration to be first to market, the fastest way forward is often to slow down first. Since innovation is not imitation, copying the ideas and strategies of other successful organizations will not necessarily produce the desired outcomes. Hence organizations must develop their own way of innovating and nurture the right style of collaboration that best suits their organizations’ people and purpose. A textbook on innovation may provide a framework to adopt, but it will not be customized to what makes your organization unique. With innovation, one size really does not fit all! With the right behavioral governance in place, organizations can achieve more and innovate at a faster pace. Key innovation behaviors such as collaboration, sharing, curiosity and trust are critical to achieving the innovation utopia that most organizations seek. When establishing the right behaviors that support a culture of innovation, an environment of ‘trust’ must be nurtured. Trust provides the glue that binds everything together. For innovation to flourish people need to feel safe and secure, and be able to trust those around them. People need to feel it is safe to try new ideas and to know that failing is regarded as part of the innovation process. What Does ‘Go Slow’ Mean In The Real World? Innovation means a different thing to different people, however, there is one constant that I hope we can all agree – real commercially meaningful innovation takes time irrespective of the industry. The majority of people in any organization will watch and wait before getting involved in new things. They want to know that getting involved is a good use of their time; after-all they’ve probably seen new initiatives come and go before! This presents a dichotomy that needs to be balanced and managed very, very carefully – on one hand there is a corporate urge to ‘go fast’ in order to build widespread belief and support – yet, on the other hand, there is a critical requirement to ‘go slow’ in order to nurture and embed the new innovation culture that delivers results. To tackle this conflict – one way that has a track record of success is to build small teams who deliver commercial value whilst evangelizing and role modelling the new innovation way. I call this the A-Team approach (my nod to the hit 80’s TV show and more recent movie reboot). In the show, the A-Team involves a close-knit team of ‘outcast’ elite operatives comprising a maverick leader (Hannibal), scrounger (Faceman), skilled mechanic (BA) and unhinged expert chopper pilot (Murdock) working together to overcome impossible odds. Back in reality, in the place of Hannibal and crew… you might want to pull together your own ‘outcast’ crew of intrepid explorers, resourceful freethinkers and progressive minds – people that are prepared to back their ideas, take the courageous leap of faith – with a collective single-minded, laser-focused discipline that is wired to overcome impossible odds. To illustrate the underpinning Go Slow, Then Accelerate thinking, AllChange and Hype Innovation co-created the below ‘Innovation Maturity Framework’ – it illustrates how to showcase success and effectively build engagement and buy-in – whilst generating the commercial value that delivers increasing returns over time. Self Evaluation: Is There An Innovation Mentality Where You Work? There needs to be a common vision in place that contains a clear and completely understandable purpose-driven mission that everyone understands. The vision needs to connect with the strategic delivery planning – connecting overarching strategy with the daily operations. The vision needs to articulate the role of innovation encompassing all aspects of work. The innovation strategy should both align-to and integrate-with the business priorities. In practical terms this requires taking a cross-disciplinary view of how the company would succeed. This holistic vision means there is cohesion throughout the company, from concept to product to sales. All employees from the board down to the front-line need to understand what innovation means to the organization in a clear and unambiguous way… this means getting rid of technical jargon and management speak! The leadership needs to create and actively promote an innovative and collaborative environment. This is about creating the right context for your organization that encourages and supports innovation, so that everyone is willing and able to innovate. All employees need to understand what innovation means and looks like in the part of the organization that they work in (business unit, division, region, function or team). When framing the innovation agenda, all employees need to understand the opportunities for them. Employees have a safe space to innovate with appropriate support, the correct tools, skills and way-of-working to participate… and with a clear sense of purpose. All employees are invited to participate, understand how to participate and, most significantly, are actively encouraged to participate. The leadership must display courage and patience in order to truly unleash and harness the organizations collective creative genius. I would be really interested to hear the Disney employee’s opinion on the above 10 indicators. If I were to speculate, I imagine they would wonder why we were asking in the first place. Perhaps they’d be puzzled why all organizations don’t have a similar culture – and possibly surprised to learn that the ‘Disney Way’ is actually not the norm for many organizations. For most of us, we need to work harder at creating this kind of culture. We also need to understand that tackling the gap is all part of the journey – keeping in mind that we must first ‘go slow’ before we ‘accelerate’.